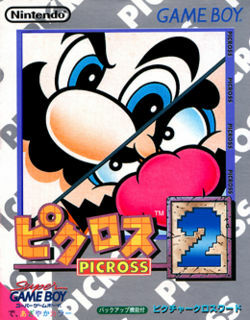 Picross 2 is a Japan-only game for the Game Boy and the sequel to Mario's Picross and Mario's Super Picross; it was released in 1996. It keeps most of the same elements of its predecessor, as it deals with a grid and solving puzzles to form images. Both Mario and Wario return and each have different sets of puzzles to solve in the game, giving the player a variety in gameplay. This is one of the few games that can be fully enhanced by the Super Game Boy attachment for the Super Famicom, both allowing full color graphics as well as a two player mode; by performing any input on a second controller, a second player is entered in to the game, and players can then solve puzzles cooperatively. In 2012, the game was released on the Nintendo 3DS Virtual Console in Japan; it has never been released overseas. Picross is a logic puzzle game in which players solve nonograms to reveal a hidden picture. In order to reveal the picture, number clues are given to show how many squares go in each row or column. For example, a "5" horizontally means that there are 5 consecutive marked squares somewhere in that respective row. If there is more than one number, they all appear in that line in their respective order, but there must be at least one blank square between them. The player can also label squares with an "X" if they believe the square should not be marked. Labeling squares with an "X" serves no purpose in the solution of a puzzle, and is only used to assist the player. Players also have the ability to mark the hint numbers along the sides of the grid at will, preferably as each consecutive group of squares is solved on that line inside the grid. New to Picross 2 are 30x30 puzzles, which are split into 15x15 quadrants. A puzzle is not complete until all quadrants are solved, therefore solving the overall 30x30 puzzle. The game features four modes: easy picross, Mario's picross, Wario's picross, and quick picross. In both easy picross and Mario's picross, the player is given a time limit. In puzzles with time limits, the player is allotted 30 minutes to complete each 15x15 puzzle, and is penalized for time for each wrongly marked square; 2 minutes for the first mistake, 4 minutes for the second, and 8 minutes for each mistake thereafter. At the start of the round, the player has the option to use a hint roulette, which cycles through the grid to completely reveal one row and one column. Once started, the player also has the option to use another hint roulette at the expense of 5 minutes deducted from the timer; this can be used multiple times as long as there is enough time remaining. When the player runs out of time, the game is over and they must restart the puzzle. While easy picross puzzles are completed after finishing a single 15x15 puzzle, Mario's picross features all 30x30 puzzles. After clearing the first stage of Mario's picross, the player is granted access to Wario's picross. In Wario's picross, the player isn't notified of mistakes or given any hints, making the puzzles harder to solve. The player has the option to enable a time limit, however, disabling the time limit will not unlock the hidden 10th puzzle on every stage. There is an option in the start menu, exclusive to Wario's picross, called "? Start"; a guessing mode where the player halts progress on the puzzle and can make temporary marks on prospective squares, which can sometimes be necessary due to the lack of hints and the complexity of Wario's puzzles. The player can decide at any time if they want to cancel the guessing mode and remove the temporary marks, letting them continue from a state prior to entering this mode. If the player correctly finishes the puzzle while in this mode, the puzzle is completed as normal. As with Mario's picross, Wario's picross also consists of all 30x30 puzzles. After clearing stage 6 in this mode, players are no longer notified if a quadrant has been completed, further increasing the difficulty. After every three stages in both Mario and Wario's picross, players must solve a quick picross puzzle. In quick picross, players must quickly create kana from multiple 8x8 puzzles to form a sentence and clear the challenge. The amount of kana required ranges from 8-20 and players are allotted only one minute per character. Each quick picross puzzle can also be solved by guessing the sentence or phrase at any point. Quick picross stages are shared between the two characters and have 10 possible solutions each. Mario and Wario both have 10 stages with 10 puzzles each, however, the 10th puzzle of each stage can only be unlocked if the player has not used hints, quit, or timed out on a puzzle in the stage. In stages 1-3, 30 minutes are allotted per quadrant, but from stage 4 onward, 90 minutes are allotted for each puzzle. The puzzles in each stage are also centered around a theme (e.g. stage 4 of Mario's picross features sports themed puzzles). After clearing stage 10, a final stage with a single 60x60 puzzle is unlocked; the puzzle is split into 30x30 quadrants (which themselves are split into 15x15 quadrants) and 30 minutes are allotted per 30x30 quadrant. In total there are 248 puzzles. Tandem Bicycle Marriage Meeting Wedding Steamy Couple What's this kiss mark?! Everyone is taller than me Good, a Super Mushroom I'm big!! Easy shot! It didn't work.. Playing Mario's Picross? I can't solve it! I wonder what it is? I got it with 2 minutes left! Hey! Where is everyone? Water Skiing Sunbathing Scuba Diving Surfer My foot is stuck in a giant clam! For a complete list of media for this subject, see List of Picross 2 media. This page was last edited on March 6, 2019, at 19:54.